Khara Ledonne, miniature painter for her eponymous etsy shop, creates beautiful canvasses fit for a borrower. The Brooklyn-based artist’s necklaces are ideal for those who want to keep their hopes and dreams hidden away and close to their heart, it’s clear the oil paintings are given all of Khara’s time, love and attention. The perfect gift for your friends and family or if you are like us, for yourself, if you want a stegosaurus hanging from your neck. When did you know that you wanted to take your creativity and work in fashion? You know how little kids will sometimes dress themselves in all the things they love most, without any regard for how it looks together? I still have the urge to do that. Painting lockets became this fantastic outlet where I can squeeze in all the color and imagery I dream up, yet keep it contained in a more presentable capsule. One can wear black from head-to-toe, but still have a hot pink mermaid dangling in their v-neck. It was a very slow and organic transition - I made things that I loved for myself until some of those ideas were noticed and gained momentum in an outside market. Where did you find the inspiration for your latest collection and what were your influences? Though I live in Brooklyn, I grew up in a rather small and earthy town on the Pacific Ocean. Many of my designs are simply my daydreams, where I want to go when I close my eyes. When I'm riding the subway underground, I long for green trees, roaring campfires, and stormy oceans. Often there are elements of escape and fantasy - full moons, mermaids, and pirate ships. 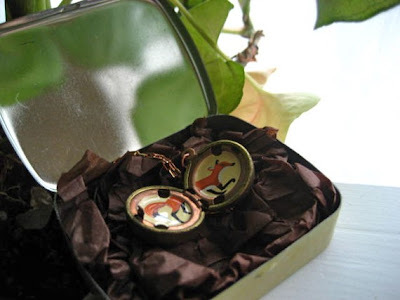 I find the locket is the perfect format for these tiny worlds because it can be exposed or kept secret. Mixing new colors totally floats my boat. It's just silly how much I love creating fresh colors to paint with - the oil enamel I use is intoxicatingly vibrant, and sometimes color alone is enough to give me an idea. Also, the requests of people for whom I paint custom orders open so many doors into new territories. They take me where I might be uncomfortable or unskilled and force me to adapt. What do you find best helps you get out of creative ruts? Usually when I'm in a rut it means I need to take a break, and remind myself that I am not a 24-hour creativity robot. After a few days away I am almost always refreshed. My studiomate - she's a gem! Re-reading positive feedback from customers also gives me a lovely boost. For me, it has always been to work with your clientele. I've been painting murals, signs and miniatures for 13 years, and I think the reason it has proved so sustainable is because I try to meet others' visions with my skills. I can get a blissful kick out of painting what I love for myself, but I can't necessarily expect to pay rent that way. It is both a struggle and a delight to adapt to what others want. Being an artist or designer can also be a solitary pursuit, and I find interacting with buyers and clients keeps me grounded and open. Nature and the love of my close friends. There is just nothing compared to the rejuvenation of laying under a leafy tree and the affirmation of someone I respect. In a more official realm, though, I would say the immensely talented painters that I worked with at a mural studio in Manhattan a few years ago. From China, Russia, Korea and Tibet - they were all bizarre characters who had much more experience than I. They put me through painter's bootcamp (I literally cried over the shape of oak leaves, facial features and faux plaster), and I am much better off for it. William Morris - that man was a force to be reckoned with. The way in which he applied strict function to lush and wild beauty is astonishing. That and the variety of his skills and workshops - wallpaper, weaving, woodwork... what I wouldn't give to lay my paws on those tools! My work and play are so thoroughly integrated that it's hard to say. If I'm not painting then I'm building, sewing, cooking or writing. Having tea with friends. And, you know, that occasional bloody mary or nap under a tree in the park. Building a house. With my own hands and lots of raw, organic materials. Foundation, framing, plumbing, electrical wiring, roofing - everything! With as many nooks and cubbies as a house can hold. Essentially I just want to make an enormous locket.